Start a new Mz3 Buch with empty pages. 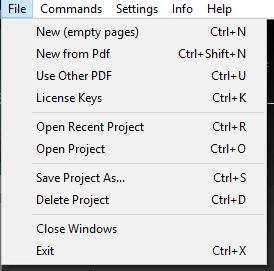 Extend an already created book, based on a PDF file with new pages from another PDF file. Duplicate the actual Mz3 Book to make a backup or to use it as a base for a new Mz3 Project. Delete the actual are any other Mz3 Project picked from the list of projects. Any number of projects can be selected for deletion.